For several different reasons, sinusoids pop up ubiquitously in both theoretical and practical situations having to do with sound. For one thing, sinusoids occur naturally in a variety of ways, and if one happens to couple physically with the air and is of audible frequency and amplitude, we'll hear it. Second, sinusoids behave in simple and predictable ways when the elementary operations (amplification. mixing, delay; section 1.5) are applied to them. Third, one can add up sinusoids to make arbitrary signals or digital recordings (with some provisos having to do with convergence); this ability is extraordinarily useful for analyzing and synthesizing sounds. where , the frequency, is the number of revolutions per unit time, and the amplitude is the radius of the wheel. This leaves the amplitude and the frequency unchanged, but subtracts an offset from the initial phase. 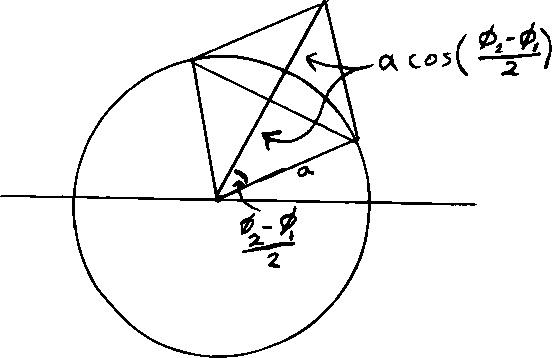 The resulting initial phase depends in a complicated way on all of , , , and --the easiest way to compute it would be to convert everything to rectangular coordinates and back, but we will put that off for another day. If the two frequencies are not equal--call them and --we can still apply the same reasoning, at least qualitatively. At time we still get a parallelogram, but now the two summands are rotating about the origin at different rates, so that the difference between the two phases, initially , is itself increasing or decreasing by a rate equal to the difference of the two component frequencies, that is, . As a result, exactly times every unit of time, the parallelogram runs through its entire range of shapes and the resultant amplitude runs back and forth between its minimum and maximum possible values, and . In other words, the signal repeats forever. Knowing the value of the function for one period, for example from to , determines the function for all other values of . If a function repeats after time units, it also repeats after , , ..., time units.. The smallest value of at which the signal repeats is called the signal's period. A sinusoid whose frequency is has period . But an infinitude of other sinusoids repeat after time units. A sinusoid of frequency has period , and so repeats twice in a time interval lasting . In general a sinusoid whose frequency is any integer multiple of repeats (perhaps for the th time) after an elapsed time of . More generally, any signal obtained by amplifying and mixing sinusoids of frequencies that are all multiples of will repeat after units of time, and therefore have a period of (if not some smaller submultiple of ). only stopping, for a digital recording, at the Nyquist frequency, and possibly continuing forever for an analog signal. Such a sum of harmonically sinusoids is known as a Fourier series, and although we won't prove it here, it's known that any ``reasonable" periodic signal, (having a certain continuity property in time that any real signal should have) can be expressed as a Fourier series. Its digital recording can as well. This means that, in principle at least, you can synthesize any periodic signal if you can synthesize sinusoids. The whole mixture is sometimes called a complex periodic tone, and the individual sinusoids that make it up are called harmonics. If all goes well, the perceived pitch of a complex periodic tone is that of its first harmonic, corresponding to the frequency , which you can compute as in section 1.3.
and is called a complex inharmonic tone. The individual sinusoids that make it up are then called partials or components, and not harmonics - that term is reserved for the periodic case described earlier. So not only is the amplitude increased (or decreased) by twice the cosine of half the phase difference; we also see that the initial phase of the resulting sinusoid (which would have been complicated to calculate in general) is the average of the two initial phases and . This formula will recur often. I call it the Fundamental Law of Electronic Music, although perhaps that's overstating things a bit. Although the nominal (peak) amplitude of a sinusoid is a perfectly good measure of its overall strength, most signals in real life aren't sinusoids, and their peak amplitudes don't necessarily give a realistic measure of their strength. Also, you could wish to have a measure of strength that was additive, in the sense that, at least in good conditions, when you add two signals their measured strengths are added as well. The nearest thing we have to such a measure is the average power, which we will first motivate from physical considerations, then define, then show that it (at least sometimes) works the way we would wish. We conclude that power, like amplitude, is a function of time; it is proportional to the square of amplitude. It is always either zero or positive. Although we aren't ready to discuss real sounds in the air yet (we will be able to put that off until chapter 5 or perhaps even 6), the same reasoning will apply. The amplitude is the (space-dependent) pressure. One can measure the power flowing through a specified area as follows: the pressure exerts a force on the area; as a result some air flows through the area, and the force times the velocity gives energy per second, which is the physical definition of power. The speed at which the air flows is proportional to the pressure (it's pressure divided by impedance)--a concept that generalizes resistance to describe ``reluctance to move" in whatever medium we're talking about.) 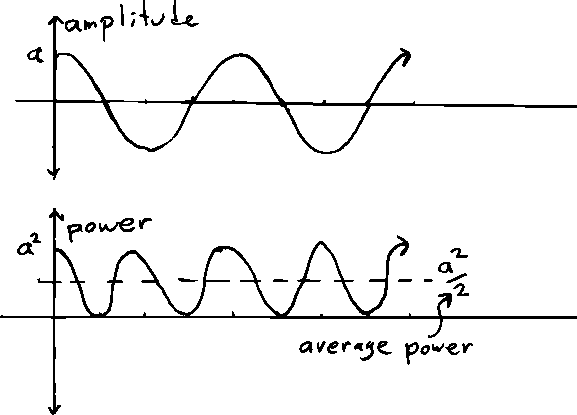 Power is then amplitude squared divided by impedance. So far we've only described instantaneous power, which is a time-varying function. The measure we're interested in is a signal's or recording's average power, which is simply the average, over some suitable period of time or range of samples, of the instantaneous power. About this we can at least say that, if we don't know what the relative phases of the two are, ``on average" we expect the power to be additive because the cosine term is just as likely to be negative as positive. Once again, we can deal with sinusoids of differing frequencies and by just letting the phase difference precess in time at a frequency . In this case the cosine term really does average out to zero no matter what the initial phases were. The power of the sum of the two sinusoids is the sum of the powers of the two summands. 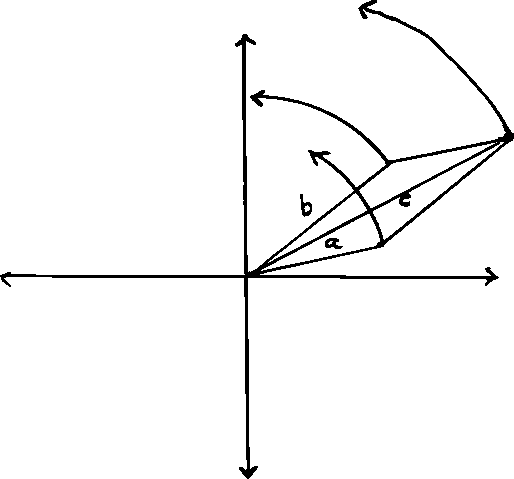 In fact, the cosine term can be considered as the two sinusoids beating. If we want to measure the power accurately we must wait at least a few beats--the closer the two sinusoids are in frequency, the longer it will take our measurement to converge on the correct answer. It might seem that it is almost always true that adding two signals, with average power and , respectively, gives a signal of average power ; but beware the following counterexample: if you add a signal to itself you will double all its values and so the average power will be multiplied by 4, not 2. If you add a signal to its additive inverse (which has the same power as the original), the power of the sum will be zero. Also, if two sinusoids have the same frequency the average power of their sum will depend on the phase difference. There is a term for the situation in which you can simply add the average power of two signals to get the average power of the sum: such signals are said to be uncorrelated. In general, scaling a signal (that is, multiplying all its values) by a factor of scales the average power by a factor , whereas accumulating unrelated signals should be expected only to multiply the power by on average. so this new definition agrees with th eearlier one in section 1.3. 1. Two sinusoids with the the same frequency (440 Hz., say), and with peak amplitudes 2 and 3 are added (or mixed, in other words). What are the minimum and maximum possible peak amplitude of the resulting sinusoid? 2. Two sinusoids with different frequencies, whose average powers are 3 and 4 respectively, are added. What is the average power of the resulting signal? 3. Two sinusoids, of period 4 and 6 milliseconds, respectively, are added. What is the period of the resulting waveform? 4. Two sinusoids are added (once again)... One has a frequency of 1 kHz . The resulting signal ``beats" 5 times per second. What are the possible frequencies of the other sinusoid? 5. A signal - any signal - is amplified, multiplying it by three. By how many decibels is the level raised? 6. What is the pitch, in octaves, of the second harmonic of a complex harmonic tone, relative to the first harmonic? Project: comb filtering. In this project you will use the phase-dependent effect of combining two sinusoids to build the simplest type of digital filter, called a comb filter. To start with, make a single sinusoid of frequency 100 Hz (using the sinusoid object in the course library for Pd). You can check the level of its output using the ``meter" object; it should be about 97 dB. Now put the sinusoid into a ``vdelay" (variable delay) object, and connect the delay output as well as the original sinusoid output to the meter. When the delay is zero you should see something 6 decibels higher, about 103. Now measure and graph the amplitudes you measure, changing the delay in ten steps from 0 to 0.005 seconds. (Hint: to make the graph readable, don't make the vertical axis linear in decibels; instead, perhaps make equal spaces for 0, 94, 97, 100, and 103). But if you really want a nice-looking graph and don't mind 5 extra minutes of effort, convert from decibels to power. Now do the same thing (on the same graph with a different color or line style) with the sinusoid at 200 Hz. instead of 100 Hz. Do you see a relationship between the two? Now put six sinusoids at 100, 200, 300, 400, 500, 600 Hz. into a ``switch" object (that's primarily for convenience; connecting the six to the switch will add them.) Connect the switch output to both the delay and directly to the output as before. As you change the delay between 0 and 10 milliseconds, what do you hear? What special thing happens when you choose a 5 millisecond delay?